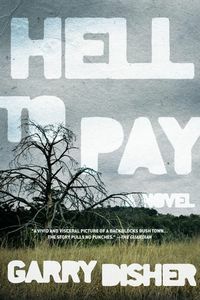 Hell To Pay by Garry Disher: Synopsis and Online Purchase Options. Synopsis (from the publisher): Constable Paul Hirschhausen — "Hirsch" — is a recently demoted detective sent from Adelaide, Australia's southernmost booming metropolis, to Tiverton, a one-road town in rustic, backwater "wool and wheat" country three hours north. Hirsch isn't just a disgraced cop; the internal investigations bureau is still trying to convict him of something, even if it means planting evidence. When someone leaves a pistol cartridge in his mailbox, Hirsch suspects that his career isn't the only thing on the line. But the tiny town of Tiverton has more crime than one lone cop should have to handle. The stagnant economy, rural isolation, and entrenched racism and misogyny mean every case Hirsch investigates is a new basket of snakes. When the body of a 16-year-old local girl is found on the side of the highway, the situation in Tiverton gets even more sinister, and whether or not he finds her killer, there's going to be hell to pay.